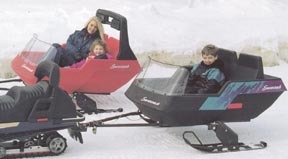 Snowcoach roomy, comfortable and safe, the Snowcoach features a patented high performance suspension and trail-proven hitch. 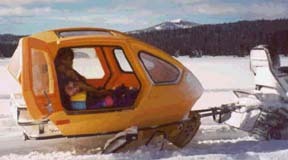 The innovative Snowcoach is the first passenger sleigh with a poly unibody. Standard features include built-in seats and a brake/running light. 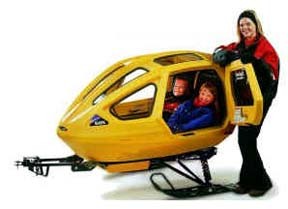 Take your family out in comfort! The picture to the right displays the new gas shock based suspension system. Two different suspensions are currently available, the picture above pictures the wishbone suspension. Both models now take advantage of the wishbone system. The picture of the open coach on this page shows the old leaf spring system. The gas shock option is expected to be available for the open coach next year. The picture below pictures the unit with the optional storage rack. The unit was being towed in more than a foot of fresh powder. 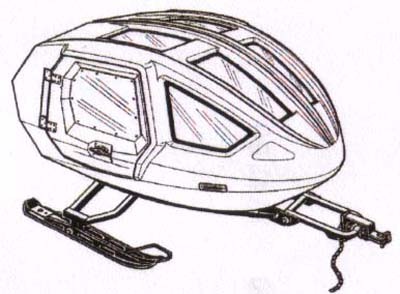 The snow flap in front of the unit is an option which helps deflect the snow thrown by snowmobiles with deep lugs reducing the noise level. * This pictures shows the old leaf spring system. This picture shows the old leaf spring system, the leaf spring system and the wishbone suspension were recently discontinued in favor of the gas shock system. We do have some replacement parts for the order suspension systems. *Discounts are available based on the combination of options being ordered, typically we try to pickup part of the shipping charges. Both models are truck shipped from factory directly to you and require some assembly (skis need to be attached, etc.). Typical delivery is 2 weeks from the time of order. We do have a limited number on hand from time to time but in general order each unit custom per your directions.